Historians are not usually known as being a very funny group of people. I can’t remember laughing out loud even once during the dozen or so hours it took me to read E.P. Thomson’s Making of the English Working Class and my own attempts at humour in lectures typically lead to more glazed eyes and groans than actual laughs. To a certain extent, this makes sense. Most of us study some pretty serious stuff and the last thing we want to do is seem like we’re making fun of our historical subjects or being condescending towards the past. And, while academic life is often absurd, it’s usually unintentionally so and, in the current job market, often leans towards the tragic rather than the comic end of the literary spectrum. 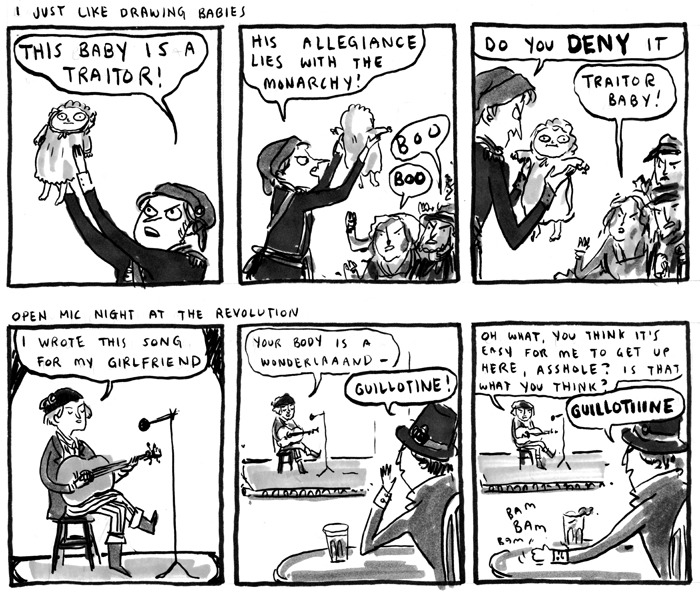 This is what makes the work of Canadian comic book artist Kate Beaton’s work so amazing. 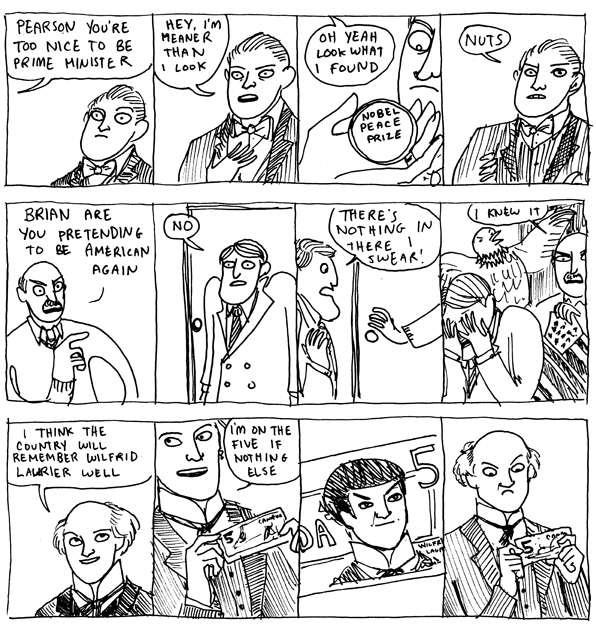 In Beaton’s skillful hands, even Canadian history is funny. (I know!?!) Take our Prime Ministers, for instance. Beaton, who is originally from Mabou, Cape Breton and holds a BA in History from Mount Allision University, has been publishing her mostly historical themed comics online for a few years now, but her recent collection, Hark! A Vagrant (Drawn and Quarterly, 2011) has seen her reach a much wider international audience. In fact, it’s been on the New York Times “Graphic Hardcover Books” bestseller list for an astonishing 18 weeks and counting. In other words, a whole lot more people are getting their history from Beaton than from the article you published in that obscure (but important!) academic journal ­– and, I would argue, that’s not necessarily such a bad thing at all. Part of the appeal of Beaton’s work is that it’s great history as well as great jokes. Like that other famous Canadian graphic artist Chester Brown, whose graphic novel Louis Riel is one of the better modern Canadian works of historical fiction, Beaton has clearly also done her research. As she recently told CBC’s Jian Ghomeshi, her comics typically take a long time to write because she aims to “make a comic that is funny to someone who knows nothing about that person and someone who knows everything about that person, who wrote their thesis on them.” The easy and whimsical look of her comics, in other words, is not a reflection of the hours of reading and work that goes into each frame. For instance, any historian of science would agree that, in just six short frames and with some dark humour, Beaton manages to capture the tragedy and injustice of pioneering biologist Rosalind Franklin’s unfair treatment at the hands of her sexist, and much more well-known, Nobel Prize winning male colleagues. 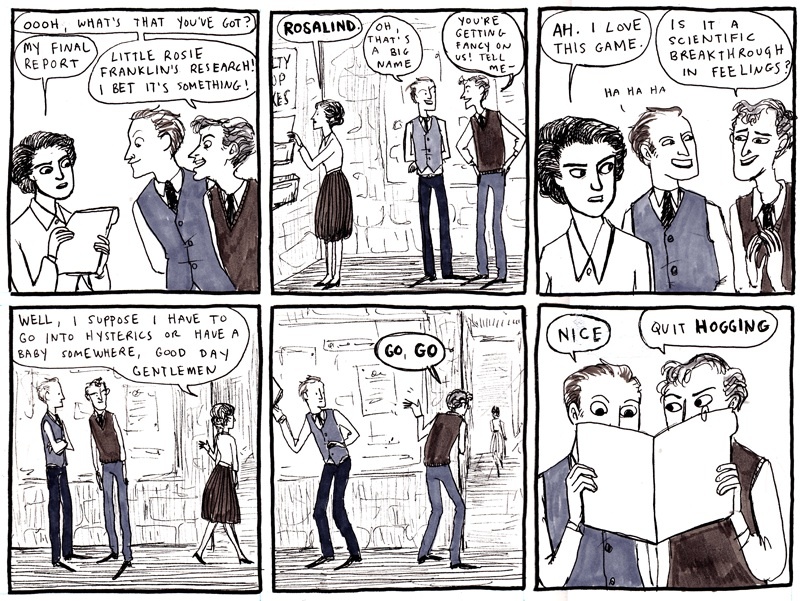 I could go on with examples (like these great comics about George Orwell, Dude Watching With the Bronte Sisters, Diefenbaker, and why Canadian history is[n’t] boring) but, really, you should just go out and buy the book. And if there’s anything we can learn from Beaton it’s that history is more funny than we think it is and, contrary to what we’re sometimes led to believe, there is a real public appetite for history. We should therefore support our homegrown popularizers of history like Beaton and Brown – perhaps by inviting them to participate our often overly exclusive conferences, by giving them some real recognition in our journals, and maybe by even trying to collaborate on a few projects that would help bring some additional financial support for their important work. And maybe, no definitely, you should just leave the jokes up to Beaton for your lectures if you want to hear more laughs than groans. 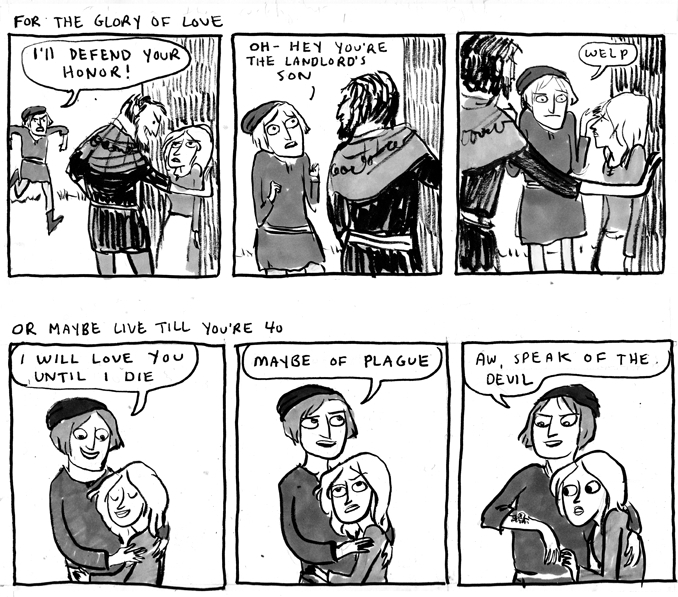 You can read Beaton’s new work via her website (http://harkavagrant.com), her Tumblr (http://beatonna.tumblr.com/), or her often very funny Twitter stream (@beatonna). Ian Mosby is a SSHRC Postdoctoral Fellow at the University of Guelph and studies the history of food and nutrition in Canada during the twentieth century. I love these. Hilarious stuff. Pingback: Graphics in the Archive: History and Comics Unite!